Two Marine Corps helicopters evacuated 21 Americans from Lebanon to Cyprus on Sunday, and U.S. officials urged others to wait for a formal evacuation plan before they try to leave. The U.S. citizens evacuated Sunday included a family of four with a sick child and four students, said Maura Harty, assistant secretary of state for consular affairs. She said the United States had receive hundreds of phone calls from Americans in Lebanon asking for instruction and urged them not to try to travel by land to Syria. U.S. security teams landed at the U.S. Embassy earlier Sunday to plan the evacuation for any of the 25,000 Americans in Lebanon who wish to leave. "It is a situation in flux, in so very many ways," Harty said from Washington. "We are working 24-7 to get this done." Israeli airstrikes on runways have closed down Beirut's international airport. Israel has also imposed a naval blockade on the country and has made road travel dangerous by targeting the main highway between Lebanon and neighboring Syria. Israel began striking Lebanon after Hezbollah guerrillas captured two Israeli soldiers in a cross-border raid Wednesday. The U.S. Embassy, on a fortified hilltop in Beirut, was buzzing with activity Sunday. Two CH-53 Super Stallion heavy-lift helicopters landed about 3 p.m. on the embassy grounds, said the 24th Marine Expeditionary Unit, which conducted the evacuation. 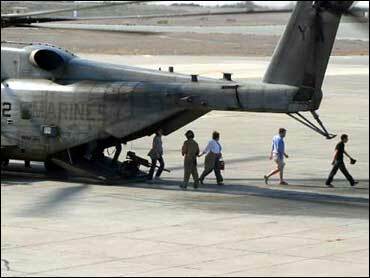 The flight to Cyprus arrived about 5 p.m, the Marines said. Col. Ron Johnson, the commander, said his unit was "setting the conditions" for additional evacuation flights if the U.S. ambassador in Beirut makes such a request. Air Force Lt. Sharbe Clark, a spokeswoman for U.S. Central Command in Washington, said survey and assessment teams had arrived to help with evacuation plans. The U.S. said Saturday it was working on a plan to evacuate American citizens from Lebanon to Cyprus. American officials believe only some of the Americans in Lebanon will want to leave. For some Americans, though, the evacuation plans happen soon enough. Reached at Beirut's American University, 21-year-old exchange student Vanessa Aponte told CBS News correspondent Joie Chen she's packed and ready, but she doesn't know how to get out. "I wanted to go to Syria like everybody else," Aponte said, "We didn't know if it was safe or not to be on these roads, because it's known as the war of the bridges and roads." Click here to get the latest information from the U.S. Embassy in Lebanon. "We're going to protect Americans," Secretary of State Condoleezza Rice said on CBS' Face The Nation. "We have contingency plans for evacuations of Americans should that become necessary... And we're helping Americans in any way that we can. That is an overwhelming preoccupation right now of our embassy and of our consulate forces." U.S. officials made contingency plans to evacuate people who cannot leave on their own. Family members and non-emergency American employees of the embassy have been given permission to leave. About 350 people — most of them Europeans — were evacuated Saturday night and early Sunday to Cyprus aboard Italian military flights. Officials from several countries urged their citizens to put their travel documents in order, but not to attempt to leave unless it was safe. France, with some 17,000 nationals living in Lebanon and at least 4,000 currently visiting, planned to begin ferrying to Cyprus Sunday any who wished to leave. Air transport would take the evacuees to Paris. Britain dispatched two warships toward the Middle East in preparation for the possible evacuation of Britons.